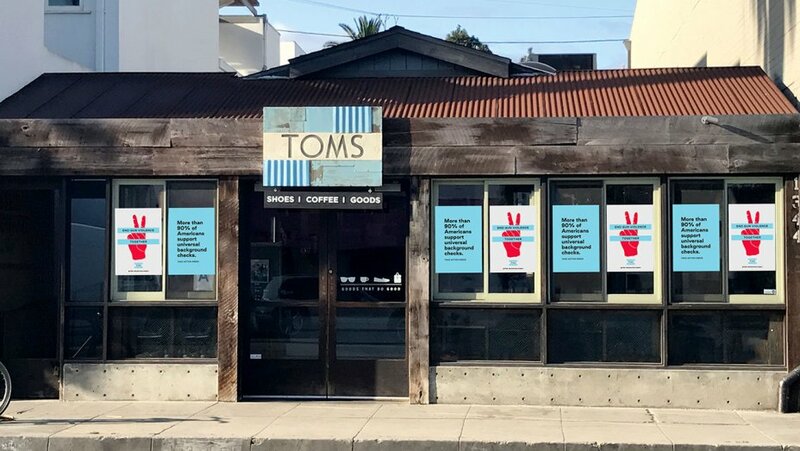 TOMS’ Shoes founder Blake Mycoskie launches anti-gun violence campaign with $5 million donation and universal background checks political campaign. TOMS’ Shoes founder Blake Mycoskie is expanding his already legendary activism and philanthropy. The recent deadly shooting that left 13 dead in Thousand Oaks, Calif grabbed Mycoskie’s brain, telling him thoughts and prayers for yet another mass shooting in America, weren’t cutting it. The shoe company is well known for its “One for One” program (you buy a pair, they give a pair), which has expanded now to also providing safe water and eyeglasses to communities in need. TOMS has never engaged in political action. Mycoskie made a $5 million dollar donation on behalf of his Los Angeles-based company to a diverse coalition of anti-gun violence organizations, making it the largest public corporate donation toward gun violence in America’s history. In addition to the donation — which benefits organizations like March for Our Lives, Everytown for Gun Safety and Moms Demand Action, among others — Mycoskie launched a Toms campaign called "End Gun Violence Together," aimed at engaging citizens with the gun violence epidemic in America. The initial focus is a call for universal background checks before a gun is sold. The initiative is supported by 90% of Americans but not Trump’s Republican Party. Jimmy Fallon filled out his postcard on Jimmy Fallon’s ‘The Tonight Show’ Monday night, with Tom’s producing an actual postcard w/the sender’s name and zip code. I just filled out mine. TOMS’ retail stores and social media are also part of the project and will become advocacy centers. “As I watched the horrific shootings in Thousand Oaks, just a few miles from TOMS’ headquarters and my home, I was overcome with immense fear for my own children and an understanding that parents across America — especially in communities of color — have been living with that same fear and loss for far too long," Mycoskie said in a statement. "We’ve been inspired by the organizations who have led this movement and by the students who have shown us unimaginable bravery and tenacity." He added: "We are ready to do our part and are asking all of our supporters to join us. Since day one, our mission at Toms has been to create a better tomorrow. Over the past 12 years, we’ve given away 86 million pairs of shoes, provided 600,000 sight restorations and helped secure 600,000 weeks of safe water to many communities. We are still committed to those endeavors and believe that creating a better future also means helping end gun violence today."